Chef Mary is an Akron Ohio Native and graduate of The French Culinary Institute in Manhattan with extended studies in Northern Italy. She was apart of the inaugural program at the FCI - The Italian Emersion Experience. Creating has been her passion since day one and her early career consistently focused on learning everything she could about the culinary industry, both in the realm of top establishments in New York City and in Private Residences as a Personal Chef. Prior to culinary school, Mary began her career as a personal assistant and Chef to a prominent family on Long Island in The Hamptons. Wanting to experience as much of living in the culinary capital of the world as possible, she spent the weekends off work in Manhattan and quickly became an integral part of the kitchen at Anthony Bourdains Flagship restaurant, Les Halles Brasserie. She continued her time at Les Halles while attending The French Culinary and this became her externship or stage. In 2006, Mary was attending Alma La Scuola Di Cucina in The Castle Di Colorno, just outside Parma Italy. Michelin star chefs from each different region of Italy would come and do cooking demos with wine pairings each week. A wine study program, under master sommelier Matteo Passina was given three times a week after cooking class. She was a part of the inaugural program, the first time The French Culinary had partnered with a culinary institute overseas to allow students to learn first hand how the Italians cook and live. Chef Mary was placed at Il Povero Diavolo on the Adriactic Coast in Torriana about ten minutes from Rimini to study under Michelin Star Chef, Pier Giorgio Parini. Mary was able to learn the importance of the farm to table movement here as she was taken on the boat to catch mackerel with her chef. They also frequented a local greenhouse and had whole pigeon, quail and duck delivered directly from local hunters. In 2007 Mary worked at a 3 Star Mario Batali Restaurant, Esca, under Chef Dave Pasternak. She was able to gain experience working with the best of the best with Chef Dave, a James Beard Award Winning chef and true fisherman. The exposure to that quality of fresh fish that was caught and delivered daily was unparalleled. Razor Clams, Urchin, Octopus, the seasonal and ever changing brilliant menus. She was able to work with elegant, unique and simplistic. This work experience ignited her passion for sustainable seafood. In January of 2008 Chef Mary began work at the most exquisite, iconic and arguably one of the top restaurants in the world at Le Cirque, under the ownership of Sirio Macchioni. She became accustomed to cooking and creating with top culinary professionals in this 5 star establishment. Notably, a participant on season 4 of Bravos top chef contestant worked all areas of the kitchen with Mary during her tenure here. She was contacted by the producer of NBCâ€™s The Chopping Block with 3 Michelin Star Chef Marco Pierre White and appeared in the finale. It was then that an opportunity arose to work for Real Estate Mogul, Jeffrey Greene on his Summerwind Yacht in Sag Harbor. While in Manhattan, Mary worked at Sonnier and Castle Catering where they catered all types of events from parties for You Tube, 50 Cent, private weddings in the Hamptons, Broadway openings at the Roseland Ballroom, private events for top celebrities, The Halloween Ball at the Central Park Conservancy, to name a few. Mary prides herself on being diverse in the kitchen, inspired by local fanfare and utilizing innovative presentations. Incorporating whimsy with plating and humor into all projects sheâ€™s involved in. 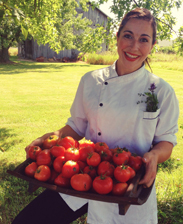 Chef Mary designed The Good Fork upon returning the Cleveland Ohio, a small successful and sustainably focused farm to fork catering and personal chef service. She challenged the stereotypes of vegetarian and vegan food by incorporating fine dining techniques to plant based cuisine much to the praise of critics, vegans and omnivores. In 2017 Mary followed her heart and relocated to the PNW in Seattle. She is now a private chef based in Los Angeles with a growing client base.